Zorb is a super-absorber designed to reduce cost and improve performance of reusable cloth diapers, nappy inserts and reusable cloth menstrual pads. ZORB absorbs 10x its weight in moisture in half a second – that’s 20x faster than cotton, bamboo or hemp knits. Zorb in an interlining type material; it goes in between face and lining fabrics. 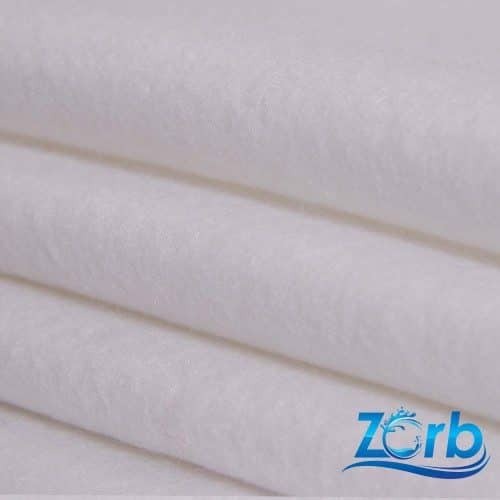 Zorb fabric is made with a combination of wicking fibres and highly absorbent fibres which reduce compression wicking. Under normal use Zorb will retain 3 times the moisture of microfibre terry. 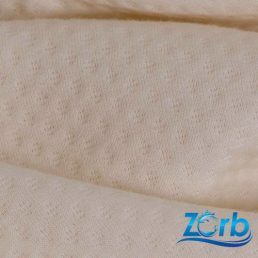 Zorb fabric is designed to be used inside a nappy or soaker. Each layer will replace 2-3 layers of conventional knit material (cotton, bamboo or hemp fleece/french terry). Pre-washing is not required or recommended according to the manufacturer. We accept payment by credit and debit card and Paypal. Card and Paypal payments are made to CuddlePlush. Delivery costs from £1.50 and depends upon the weight of your order. We only ship to UK addresses.